As tourist season reaches its peak, we at the bookshop still have two feet in summertime despite its end fast approaching. August started off with much excitement as local author and hiker William Monk hosted a book signing and reading in correspondence with the release of his new work of non-fiction, Whistler’s Walk: The Appalachian Trail in 142 Days. Having garnered attendees from across the province, Monk’s signing was a huge success, as well as an informative session for many who aspire to hike the trail themselves. Though mid-heat wave (and consequently mid-exhaustion), we’ve had two more events up our sleeve for August. Saturday the 18 we featured a double book launch from local author and artist Jan L. Coates. 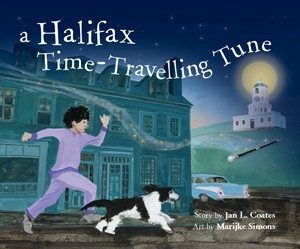 Releasing her new children’s story, A Halifax Time-Travelling Tune, and her children’s novel, Talking to the Moon, Jan not only shared from her two texts, but also conducted a corresponding craft, and served attendees plates of her delicious cookies. To answer your question – yes, Jan does it all. On the following Saturday, August 25, The Box of Delights is collaborating with Tessa of Valley Vixen to offer an introductory workshop regarding gender identity. This workshop will feature discussions regarding LGBTQ+ identities, communities, history, terminology, and resources, with a hands-on button making activity to follow. The event will welcome listeners of all ages, from those who are familiar with the ideas at hand, to those who are happily looking to learn more before our summer events come to a close. Though many bookshop dwellers continue to cling to light stories of summer, our red shelves are swiftly shifting, as beach reads take a back seat to the inevitable influx of course requirement classics: Pride and Prejudice and The Odyssey take over the spaces where The Campout Cookbook not so long ago declared its home. However, it’s not all doom and gloom regarding the change of season – the excitement of a fresh September start is brewing next door at Acadia, and it’s contagious. For more information, visit facebook.com/boxofdelightsbooks/.